Zoho Projects is a fantastic online project management solution which offers everything teams need to create work projects. Zoho Projects comes from the Indian software development company Zoho Corporation which was founded in 1996. The project management solution allows users to plan and track projects, and is suitable for teams of all sizes, with various pricing tiers. Zoho offers project scheduling and budgeting. Team leaders can define project tasks, assign work to the team, estimate costs and keep an eye on the progress of their project. It also includes document management whereby users can share documents through the portal. There are mobile applications for iOS and Android, too. Zoho Projects has a variety of subscription plans. Each includes a 10-day trial and is competitively priced with plenty of options to choose from. The Standard package is $25 (£19.50) per month. This includes 10 projects, 15 users, five project templates, files of up to 5GB, time tracking, task duration, Google task sync, CRM integration and Gamescope (we’ll talk more about that later). This package is geared towards small teams. The Express plan is $50 (£39) per month. It offers all the features of the Standard package plus unlimited projects, 25 users – costing $3 (£2.30) per additional user – 10 project templates, files of up to 20GB, custom views, recurring tasks, timesheet approval, invoice and books integration. The Premium package, which Zoho deems its most popular, starts at $100 (£78) per month. It includes all the features of the other two tiers plus 20 project templates, files of up to 100GB, four types of task dependency, project budget, strict project management, multiple integrations, business rules, automation for issues and a resource utilization chart. You can add more users for an additional $4 (£3.10) per person. The Enterprise plan weighs in at $150 (£117) per month. Extra features included are 30 project templates, files of up to 120GB, custom fields, profiles, roles, domain, a global Gantt chart, critical path and a Service Level Agreement for any issues. However, for much smaller groups, there is a standard free plan. This includes five users, two projects, Google apps integration, custom status for tasks, feeds, calendar, forums, and files of up to 10MB. If you are looking for free software with more free storage, then Wrike might be a better option, as it includes 2GB of free account storage. Setup is straightforward, and you are walked through ‘Tasks and Subtasks’ in the form of very colorful slides. You need to choose your industry, timezone and which features of the plan you’d like to use. We chose to try out the Premium plan and selected all features. Once this has been completed, a YouTube video pops up which acts as a guide on how to use the various features of Zoho Projects. You are then brought to the main interface. This displays a status bar which reflects how much of the setup process you have left to complete. At this stage, there’s about 80% left to do – but you don’t have to complete all this immediately. The interface is beautifully presented and very simple to navigate. It is also hugely responsive. Tasks, Issues, Milestones, Calendar, Documents and Reports are clearly displayed on the left-hand side of the screen. You can also access Timesheets, Finance, Forums, Pages, Chat and Users here also. If this layout is not to your liking, you can reorganize your tabs. Users can access their profile, setup, notifications, choose to add items, start a timer, and search from the top-right of the screen. The main screen displays your overview, tasks, global reports, issues, any work items for that day, overdue work, milestones and timesheets. Zoho Projects offers several different reports and charts. Each is very easy to setup and read. 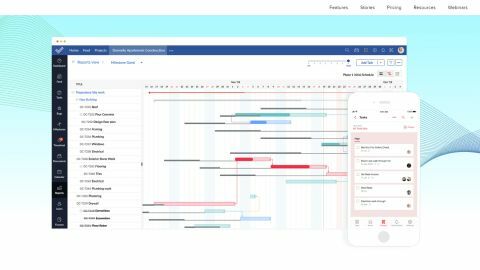 The Gantt chart clearly shows your tasks and milestones – this is done in conjunction with the Chronology and Milestone Chart. You can edit, apply features and customize all charts. You can track your teams’ progress each week with the resource utilization report. From here managers can also assign tasks to team members. The reports tab can issue a summary of any problems you have encountered during the project. There is also a handy timesheet report which helps you keep an eye on your teams’ productivity. All reports can be exported to PDF. Zoho Projects endeavors to bring fun to work and group projects with Gamescope. It’s designed to encourage productivity and to introduce healthy competition into your team. This feature is unique to Zoho – it can’t be found in competing project management software like Trello. Each time a team member makes progress with tasks and issues they earn points. They can earn trophies by scoring the maximum number of points on offer. Users can also win badges for targets they reach, or even challenge each other to be the first to complete chosen tasks by the end of the day. You can play for prizes, pizza or just plain old fashioned respect. Unlike many competitors such as Microsoft Project, Zoho has its own integrated live chat feature. This means that you don’t have to switch from the application to another program to converse with other members of your team. Each chat can be created to include multiple users, and the chat history is also saved and can be accessed at a later stage. Zoho Projects integrates with several other applications. These include Slack, Zapier, Microsoft Teams, Google Drive, Github, Bitbucket and Crashlytics. As for mobile apps, there are versions for both Android and iOS. This makes the product an attractive option for teams with members on the move. Zoho Projects really does have everything. The interface is streamlined and friendly to use. There is little to no learning curve, meaning that you can be up and organizing projects in no time. It has all the tools that you and your team will need to manage projects, with all the features necessary laid out in a simple fashion. The free version offers enough options for you to decide if it’s right for your purposes. Note that there are also 10-day free trials available for all the paid tiers. Zoho Projects is an excellent choice for those who want to make group projects fun and interesting.